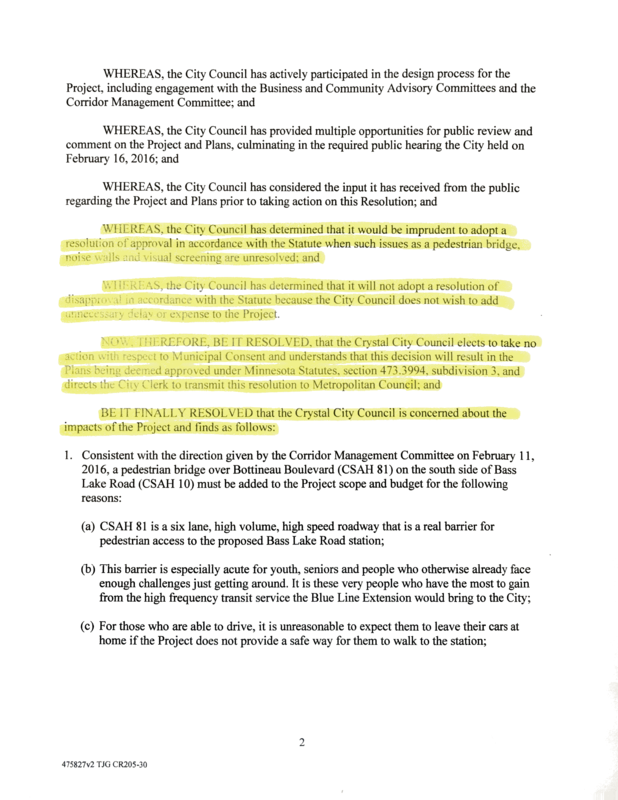 Tonight the Crystal City Council passed a resolution on a 4-2 vote making the choice not to affirmatively grant, nor to pass a resolution to disapprove, “Municipal Consent” on the Blue Line Extension LRT project. Because that’s the type of sentence that could only exist in the context of government, I’ll do my best to explain what the vote we took tonight means, what it doesn’t mean, and some of the reasoning behind the vote. MN Law dictates these options, and also dictates the narrow set of parameters we are allowed to consider when taking this vote. 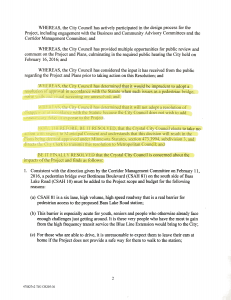 The council was NOT taking a vote on 1) Whether Light Rail is really neat, 2) Whether Light Rail is really dumb, 3) Whether Light Rail is good for Crystal or 4) anything else. This is important, and very frequently gets lost in the discussion. We chose option 3- to allow the plans to be deemed approved as presented. The practical effect of this option is the same as an approval. The project will be allowed to continue, and our vote did not delay the project nor add any additional taxpayer expense. We were presented with a set of plans at the beginning of this year – these were the plans that were on display at City Hall and presented at the various public hearings. For me, the issue was not so much with what was included in these plans, but rather what was not. 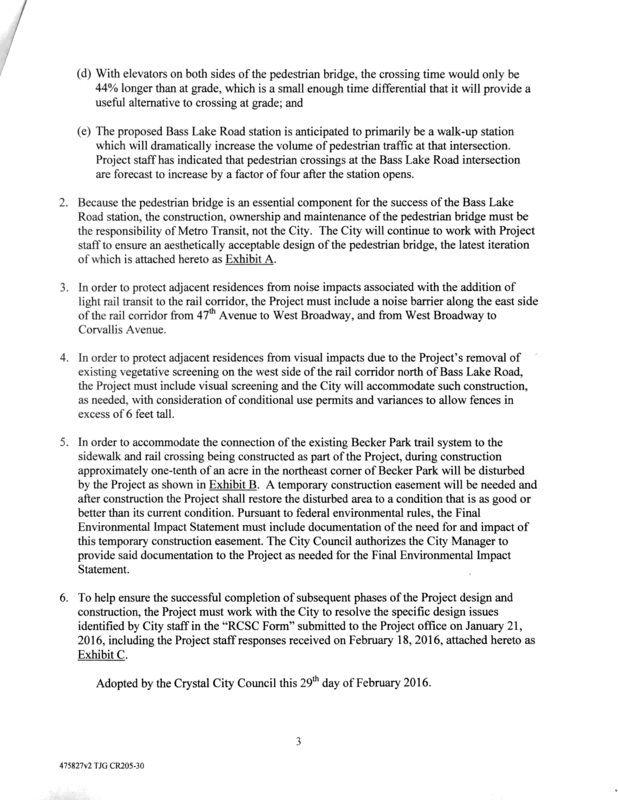 Because the project is only at the 15% design phase, several critical items were not included in the plans, among these the Pedestrian Bridge at Bass Lake Road and 81, sound screening south of Bass Lake Road, and visual screening north of Bass Lake Road. These are all items that were brought up by members of the community in public meetings and during the public hearing. It is the position of the Met Council’s Project Office that those items were out of scope at this phase of the project, meaning they weren’t going to be part of the plans that we would approve or disapprove. 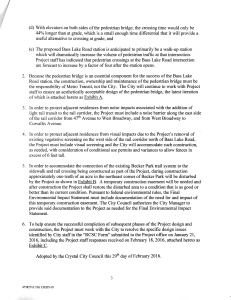 But here’s the rub- this is the one and only time that the Crystal City Council gets to hold a vote on the design. We don’t get another vote at a later date. This is it. The seemingly logical choice would be to issue a resolution of disapproval and add the “missing” design elements to the project scope. But, that wasn’t a real option, because we are only allowed to consider what’s “in scope” at the 15% mark of the project. If we would have voted to disapprove based on the 3 items outlined above (pedestrian bridge, visual screening, noise wall), we would not have gained any better reassurance that those items would be added, as the items would very likely be ruled out of scope by the Met Council. With that reality, the only practical effect of a vote of disapproval would have been to waste a lot of people’s time and drive the cost of the project up needlessly. So with disapproval off the table as a good option, Approval seems to be a logical position. But I would ask – how do you vote to approve something when you don’t really approve of it? The unresolved items are critical to this project, and the lack of their inclusion in the plans makes it very hard to take an affirmative vote of approval. So with approval and disapproval eliminated, we get to the third option, which is allowing the plans to be deemed approved. As outlined in State Law, if a city does not pass a resolution of approval or disapproval within 45 days, the plans are deemed approved as presented. This option, as imperfect as it is, was the best option available to us. 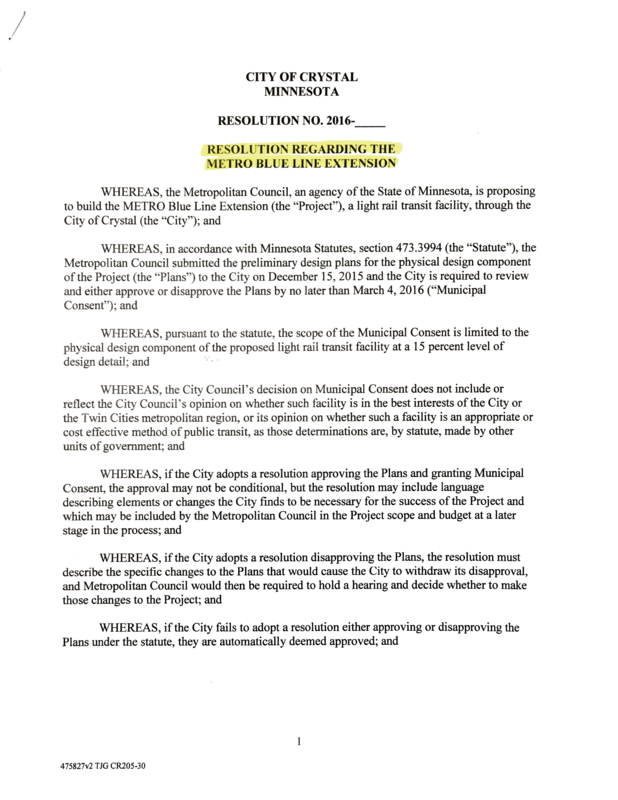 The council passed a resolution that specifically outlined our concerns with the unresolved elements, but also allowed the process to continue without unnecessary delay or cost. We didn’t disrupt the process, but we also did not add a phony stamp of approval on a set of incomplete plans. 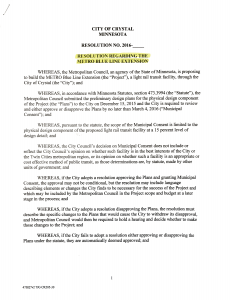 The so-called “municipal consent” process is broken. Cities are required to take their municipal consent vote prior to having the results of the Environmental Impact Statement. The process asks for feedback from cities and residents, but does not allow for incorporating their feedback in a meaningful way. The process is not about the acceptance or rejection of the concept of Light Rail, but you would not know that based on the way the topic is discussed, and the out-sized emphasis placed on the results of this vote. We were given an imperfect process, and we ended up with an imperfect outcome, but to me the best of the bad options we were given. UPDATE: I’ve added a scanned copy of the resolution that was passed below. Click to see the full sized images. And here’s council member Dahl’s take and the SunPost write up. Thank you for doing such a good job making an imperfect process a bit more understandable for we citizens.